Bobbi Brown about how she founded Bobbi Brown Cosmetics and her new book "Pretty Powerful"
You are ushered into a semi dark room, the screen before you glows ominously and you can feel your shoulders slump involuntarily as you shuffle sideways to your seat. The first slide is produced with multiple rows of tiny text, followed by a complex diagram with colour that is burnt onto your retina and bullet point by bullet point, you begin to slowly succumb to ‘Death by PowerPoint’. This scenario is reproduced daily in boardrooms, training rooms and conferences all over Australia. At best it is annoying and may induce prolonged somnolence, at worst it causes cognitive overload and reduces information retention. PowerPoint was introduced as part of the Microsoft Office package over 21 years ago and it revolutionised the way we deliver presentations. We no longer need the hand written overheads or to spend up to $8 per slide to have them professionally produced. PowerPoint provides us the software to prepare our own slides quickly and easily with the only cost being our time. Slowly, slide by slide PowerPoint took over our presentations and changed the way we communicate. These days when you ask someone to give a talk the first thing they do is open their laptop and start punching away at slides. But is using PowerPoint the best way to communicate our message? “Popular PowerPoint templates usually weaken verbal and spatial reasoning” He goes on to criticise the PowerPoint presentations by NASA engineers suggesting that their ambiguity contributed to the events that lead to the Columbia Disaster. So where does that leave us? Do we ban PowerPoint presentations altogether as Scott McNealy the Chairman of Sun Microsystems famously did in 1997? PowerPoint however does have its supporters. Other schools of thought suggest it is the user and not the tool that is the problem. Richard E Mayer Professor of psychology at the University of California suggests that the use of PowerPoint with pictures can be effective as people learn better from words and pictures than from words alone. Cliff Atkinson in his book ‘Beyond Bullet Points’ (Published by Microsoft Press) believes in the power of stories and that by applying a three step process: script, storyboard and production, you can go beyond bullet points and produce engaging and memorable presentations. From my experience in facilitating workshops on presenting with PowerPoint I find that there are two main challenges. The first challenge is that people fear presenting and because they are not confident in their material they use PowerPoint as a teleprompter or crutch. The second challenge is information overload. This occurs when presenters don’t know what is important so they put everything up on the slide in an attempt to cover all bases. Both these problems can be overcome by getting back to basics and following these simple steps. 1. Set your objectives – What do you want your audience to do say think or feel as a result of this presentation? 2. Research your audience – what is it they need/want to know about this topic? 3. Develop your topic – use mind mapping to flesh out your topic delete everything that is not relevant to your objective or audience. 4. Structure your presentation – Develop an introduction, cover 3 main points in the body and conclude with a summary and a call to action. 5. Decide what is the best way for delivering your message? – Do I need to use PowerPoint? Would a workshop, discussion or role-play work best? 6. Stories sell facts tell – Include anecdotes, metaphors and stories so people can visualise your message. 10. Use the ‘B’ key frequently – By blacking out the screen you bring the focus back onto you and the audience which encourages interaction and reflection. 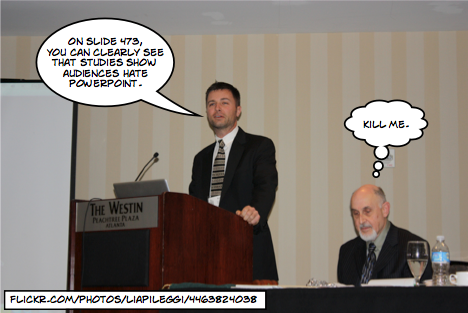 So be brave… get your PowerPoint slides back to what they should be – a visual tool only. Step out from behind the screen, take a big breath, smile and engage your audience – after all they have come to see you the speaker not the PowerPoint computer show. Sharon Ferrier, through her business ‘Persuasive Presentations’ consults to organisations and individuals who have a need to improve their communication, presentation skills and confidence in public speaking. Her ‘Escaping PowerPoint Purgatory’ workshops run for either a full or half day and can be tailored to meet your teams needs.